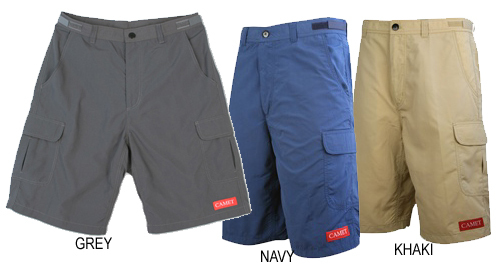 These shorts are made out of a soft, brushed mid-weight Supplex, for fast drying. They are lightweight so you can stay cool and comfortable all day. Reinforced with a Cordura seat pocket, which stands up to hard wear and is abrasion resistant. This pocket has a velcro closure on the top to insert an optional foam pad. Gusseted crotch for full range of motion, and loose fit. SKU#CA8000 Two roomy side cargo pockets, with velcro closure flaps, and a phone pocket inside. Two deep side pockets, and velcro waist adjustment straps. Inseam: 11.5"